A car seat protector is an accessory used to protect the vehicle’s car seats from the car seat (although backseat protectors are used to guard the back of the front seat from scuff marks). The need for such a fitment is obvious. Even though the motor industry has to account for the legal requirements for child’s safety on the road and keep their cars compatible with the safety car seats, it does not mean that the aesthetical qualities of the vehicle’s car seat will not be ruined by the safety car seat. A car seat’s base is often far from soft and may be quite damaging for many materials used in vehicles’ car seats, including leather. 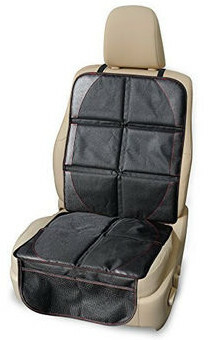 It is a little wonder many people want the best car seat protector for leather. However, things are not quite as simple as they seem. 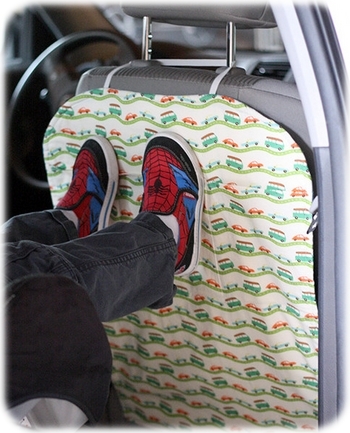 You can use a seat mat if you want, but only as long as using it does not compromise your child’s safety. A seat protector can do that if you install an ill-suitable one or, sometimes, any at all. The question is, how to avoid that? A car seat mat as such does not contribute to the safety of your child but neither does it affects it negatively. This risk comes from the mat separating the car seat from the surface of the vehicle’s car seat. This is not necessarily dangerous but it has the potential to be. What could possibly go wrong? A number of things. The seat protector is not part of any car seat. As such, it is not outside the realm of possibility that it might be shifted either when you install the car seat or when the car accelerates and decelerates. And since the mat is positioned between the car seat and the vehicle’s seat, a properly installed seat may be loosened on accident. Too many people do not install their car seat properly as it is, ill-fitted seat covers only contribute to the problem. Even though a seat protector may be dangerous to use, that will never be a possibility if you know when and how exactly you should use it. Yes, it is just not possible to use one sometimes, but if that is the case, you will know that thanks this review. We strongly advise that you read the manual that comes with your car seat. Not only will it help you to find out how to install your car seat properly, you can find a lot of information in there. Information important for using a car seat mat. The manual will often specify what can be used to protect the vehicle’s seat. Sometimes it might be a very specific car seat mat, typically made by the same manufacturer. We recommend that you follow such recommendations. Sometimes, use of a towel or a blanket is allowed. If that is the case, you can use a car seat cover more or less freely. Alternatively, you can indeed use a blanket or a towel. We do not recommend that, however, it is safe to use them in such a case. First of all, we do not recommend using soft mats unless the car seat manufacturer explicitly allows using towels or the mat you are going to use. The reason for that is that soft fabric cannot resist the force of a car crash and will easily give in. The mechanics of such an event is very similar to the behavior of a loosely installed car seat. In fact, we recommend that you avoid using towels, blankets, and thick car seat protectors entirely. It would be better to go for thinner protectors made of sturdy materials. A word of warning first. Do not use the mat if you have to adjust the car seat installation to fit it in. It is a sign that this protector will be unsafe to use. Return it to the vendor. For online stores, such as Amazon, it means sending the protector back. Alternatively, you can try using it with another car seat if you have several children or you can give it to someone. Chances are, it will fit. That way you will save some money you would spending on gas or delivery service. You should check out if the mat is cleared by the car seat manufacturer for using with their seat if you have not done that when purchasing the mat. Compare how the car seat behaves with and without the protector. To do that, you have to install the car seat over the protector and then remove the latter. This can be done by undoing either a LATCH connector or the seat belt. After the mat is gone, click the belt back in or reattach the LATCH without loosening either. Inspect the car seat. If it moves too freely, the car seat cover is not a good match. 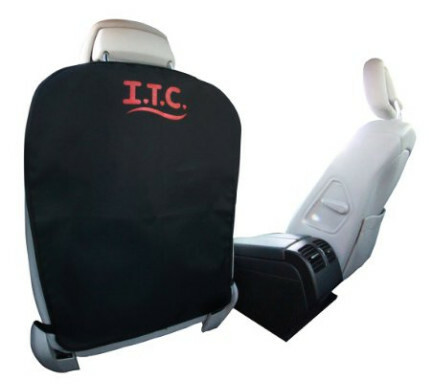 If the car seat does not move more than an inch, the car seat mat is suitable for future use. Car seat mats, otherwise known as car seat protectors, are not regulated by the federal safety standards. That means that any claims as to a mat meeting or exceeding federal safety standards are nothing more than words. Not technically a lie, since it is not hard to comply with non-existing standards, but there is nothing useful in such claims. The Khomo Gear car seat cover is a fine specimen for this class of car seat accessories. It is very inexpensive but it does make a good supplement for a car seat. Be advised, however, the padding is quite thick. This is entirely by design but there is a possibility this particular seat may be too thick for your car seat. That said, it does make the back seat area more protected compared to many other products. The cover is also very easy to keep in place. The waterproof fabric the protector is made of also serves to improve the protection of the seat. 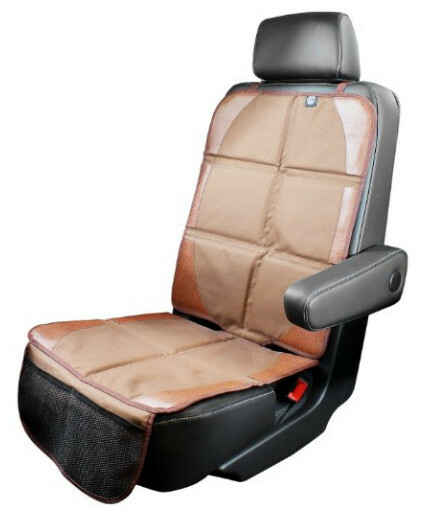 With this seat, you will not have to worry about your vehicle’s car seat being contaminated by fluids. Even if your child spills some juice, the seat protected by the Khomo Gear will be perfectly fine. The area the cover protects is not limited to the contours of a baby car seat. The protector goes all the way to the top and it is extremely easy to install even if you have no experience with seat protector. However, you should know that for the time being, the cover does not come with instructions. It may be intuitive and simple enough, but instructions are not included. This is definitely a disadvantage. However, it is countered by the two mesh storage compartments below the base of the seat. Even if your baby car seat has nothing of the sort, you can still use the ones attached to this cover protector. Calling a product of any kind “Best” is surely a very loud statement. While we are dubious as to whether this car seat protector is indeed the best of its kind, all things considered, there is little doubt it really is at least one of the best. This product can boast a number of features unique to it. First is the straps, arguably the longest in the industry. The length is not important by itself but it does matter when the car you have has non-standard seats. This seat protector from Kick Mats is a perfect match for most cars, minivans, and SUVs, and it will cover the entire back of the car seat. However, the base requires extra protection. The cover is very easy to install. It takes very little time to finish the installation. To compare, installing a car seat takes a lot more time unless we are talking about a seat with a click connect system. Even then, this comparison might end not in favor of the car seat. Cleaning the cover is also extremely easy. All it takes is to wipe the protector with a damp cloth, and you are done. No need for dry-cleaning, scrubbing or even soap. The protector is not very thick, which is certainly a bonus, and it is extremely durable. Perhaps, not good enough to survive careless handling but it will not wear out any time soon. The car seat will easily expire first. Despite this cover being a very good quality one, it is very cheap. A very good investment and a perfect way to save money. The DuoMat has a very simplistic design. Contrary to what some people might believe, that is not necessarily a bad thing. 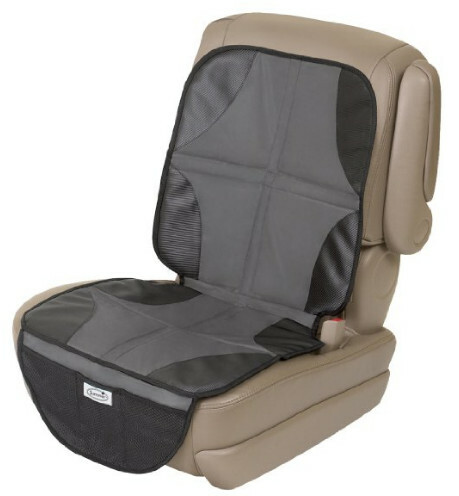 An intricate pattern might be aesthetically pleasing but the main purpose of a seat to protector is to serve as a barrier between the base of a baby car seat and the vehicle’s car seat without compromising the safety of the little passenger. Which the DuoMat is perfect for. The cover is made of plastic. While not the most classy material, it is certainly waterproof and durable. It also makes the seat cover relatively cheap and easy to clean. It is also extremely thin and lightweight, a good thing for a seat protector. At the same time, it has a non-slip surface that grips the upholstery. The upside is textured in order to maintain an even better grip on the base of the car seat. The DuoMat is a Chinese product. It is a fact that many people prefer American products, and, if you are a patriot, this is something you should know. The cover comes with mesh pockets for storage and side slots capable of accommodating seat belts and LATCH anchors. As pretentious as this name is, the Super Seat Saver Mat is indeed a very good choice. However, it is not the cheapest cover, far from it. It is at least twice as expensive as some other good quality covers. On the other hand, the price is certainly justified. The Super Saver is compatible with the LATCH system and it is a good fit for any type of safety car seat. On top of that, it can work on its own as well. That alone makes it something better than a mere car seat protector. It stands to reason that a cover of this class has a durable non-slip surface. The fabric is easy to clean as it is washable. The Super Saver has a sophisticated design thank to which it is a good match for any vehicle and car seat. It is also waterproof. Unlike many car seat covers, the Super Saver cover not just the seat and the back but the front of the seat as well, protecting the seat even better than a typical high-quality cover. Despite an already impressive list of available features, it should be said that this seat protector also comes with organizer pockets. After all, some extra storage space is always a good thing. The word “Luxury” is not part of the name for nothing. This is more than just another high-quality car seat cover. No, the Luxury Car Seat Protector is definitely not generic. Every Luxury protector is hand-made from luxury Oxford fabrics and polyvinylchloride leather. Thanks to that, it both looks classy and stylish and is very durable. It does not cover the entire seat but it is simply not designed that way. The cover is meant to be as discreet as possible. At this point, it is only natural to expect that the cover is LATCH-compatible. It is, and it also comes with a spacious mesh organizer for storage. More space means more fun, after all. 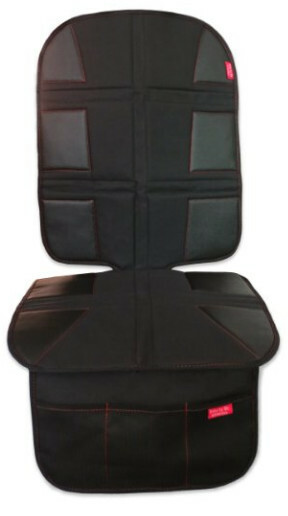 The Luxury is a good match for any vehicle and car seat, and it is much taller than typical car seat covers. Although, given the fact it is a luxury seat, you should consider the fact it is better suited for seats with a dark color scheme. It can still work with seats that have a light scheme but it is important to follow the instructions carefully if the seats have leather upholstery. The transparent PVC layers are very much unlike what you would expect from a typical plastic film. For one, the PVC has the anti-slip property and offers a better grip than many other seat covers. It is also waterproof, as expected. The Luxury is not a very thin cover but it is also not very thick. The thickness is carefully balanced between protection and safety. It is possible thanks to the heavy duty materials used to make the cover.